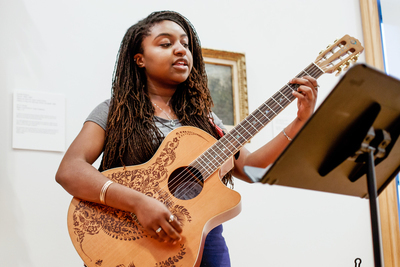 Kayla DeSouza performs at the first Art Remastered event at Krannert Art Museum in May 2017. Local musicians composed new songs in response to a piece of art at the museum, then performed them next to the artwork. The museum will host an Art Remastered event Feb. 23. CHAMPAIGN, Ill. — Krannert Art Museum will host Art Remastered this month, an event that will “break the quietness” of its art galleries and encourage visitors to interact with the artwork through music. Six local musicians will compose new music in response to a piece of art at the museum. They’ll perform their compositions in the galleries at Art Remastered at 7 p.m. Feb. 23. “We’re providing an event where people can come and focus on the performances but still be looking at and engaging with the artwork, in kind of a unique way,” said Kamila Glowacki, the museum’s education coordinator and the organizer of Art Remastered. Krannert Art Museum periodically hosts concerts and performances in gallery spaces. “It seemed a natural jump to have the music be about the artwork on display, rather than using the museum just as a venue,” Glowacki said. Such events are important for Krannert Art Museum in order to reinforce the idea that the art collection and galleries are for everyone, said Julia Nucci Kelly, the museum’s coordinator for communications and marketing. An academic art museum is a place for campus communities and the public to intersect, she said, and the museum should encourage those connections as part of its role as a civic institution. “That’s the reasoning behind our robust public programming. It's why we love to support new ideas like Art Remastered. Every visitor who comes through the doors for this event will share the experience of winding their way through the galleries, listening to new music by talented local artists,” Kelly said. Glowacki organized the first Art Remastered in May 2017. She is a musician who performs with several local bands. “I was interested in bringing that community into the museum space. Musicians and artists often think in the same ways, and I think it was a very natural collaboration between these two communities,” she said. In selecting the musicians, Glowacki looked for variety in both the genres of music – including hip-hop, country/folk, punk and rock – and in the musicians’ backgrounds. She also considered those whose writing styles would be a good fit and who are comfortable performing solo, even if they usually perform with bands. The musicians are CJ Run, Sharon Li, Teddy Lerch, N. M. Garcia, Keegan Gulick and Olivia Tasch. At the event, the musicians perform one at a time, rather than simultaneously, and the audience and musicians walk through the galleries together to each artwork where a musician will perform. “It is really exciting to see what each musician is attracted to and to see what their interpretation of the piece is, and to really bring it to life in a different way,” Glowacki said. Editor’s notes: To reach Kamila Glowacki, email glowack3@illinois.edu. More information about Art Remastered is available online at https://kam.illinois.edu/event/art-remastered.